Gaia ESA space mission is going to be launched in August 2012. This galactic survey will provide the major census of stellar cluster ever known. It’s thought that most stars are formed in clusters; thus, clusters are the basic pieces of the stellar population in galaxies. Therefore, the study of formation of clusters in the Milky Way, their interaction with the ISM, their spectral and dynamical evolution, are crucial to understand the history of star formation and the structure of our Galaxy. GREAT ESF Research Networking Programme is aimed to facilitate the interaction of European groups towards the fullest and successful exploitation of this unique space mission, enabling to provide answers to the key challenges in our understanding of the Galaxy and Universe. 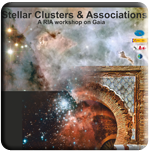 Stellar Clusters & Young Associations GREAT Working Group has accepted the challenge and has recently organized two workshops in Padova and Catania and as a natural continuation is now proposing a scientific Workshop in Granada.